Teacher fills a container with large rocks and asks the class if they think the container is full. The class says “yes, its full”. Teacher starts adding smaller rocks by shaking the container until no more small rocks fit. He then asks the students again if the container is full. Again the class answers in the affirmative. One more time, the teacher proves them wrong by adding sand to the container. When I think about this story I think about the container being my time. Too often I fill my time with small stuff (sand) like TV. Then I wonder why I don’t have time to read or write a blog post. I made this sculpture (I guess I can call it a sculpture, right?) 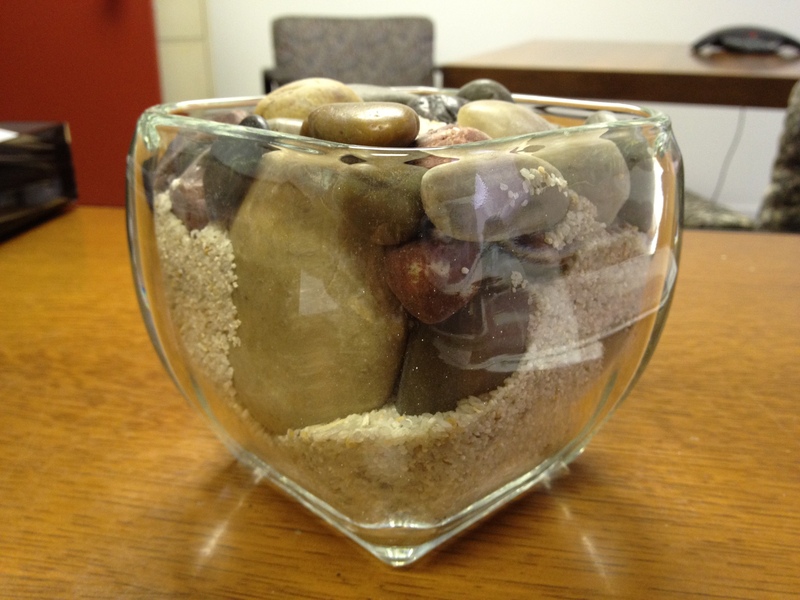 and put it on my desk at work to remind me that I need to add the big things first before I add the sand. How about you? Do you start with sand or with rocks? This post was inspired by Sensei Krebs who was the first person to tell me this story. He also continuously encourages all of us to start with the big stuff. You are currently viewing the archives for October, 2012 at Observe Inspire Lead.